Last week, I reviewed prices and ratios of gold and oil from 1946 thru 1969 when both commodities were fixed by fiat in US dollars. The chart shows that the prices of gold and crude oil are most often positively correlated but oil is generally more volatile. At times there is a strong negative correlation. Both commodities are subject to exponential rises, parabolic falls, and short-lived spikes. Ratios < 8.0 are quite unusual, occurring over 11 months or less than 2% of the time. They occurred in November 2000, six months during the spring, summer, and fall of 2005, and from May to August of 2008. Ratios from 8.0 to 10.0 constitute one-tenth of the record. 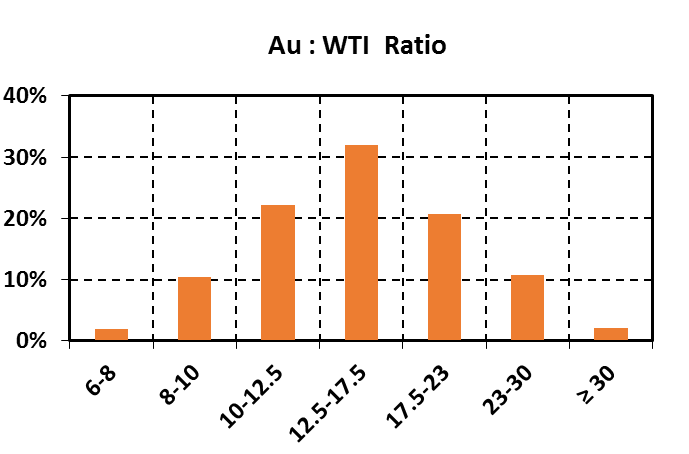 Au:WTI from 10.0-12.5 comprises over a fifth of the monthly ratios. The ratios between 12.5 and 17.5 occupy nearly a third of the distribution. Ratios from 17.5-23.0 make up slightly more than one-fifth of the data. The 23.0-30.0 interval covers about one-tenth of the months in our compendium. The 12 monthly outliers at >0 comprise slightly more than 2% of the total record. These abnormally high ratios occurred twice in 1973, 1986, and 1988 respectively, and six times during the summer and winter of 2016. Our treatment begins in January 1970 when both gold and oil prices were largely fixed with an anomalously low ratio at 10.4. The ratio remained quite low at 11.5 or less until the so-called Nixon Shock in August 1971 when the “gold window” was closed. This action was followed by two official dollar devaluations before it was completely severed from gold in February 1973. Other industrialized countries floated their currencies on world exchanges a month later. Rampant US inflation from oil imports, the Vietnam War, expanding social programs, and the Federal Reserve expanding money supply resulted in a five times increase in gold prices in the early ‘70s. In July 1973, gold soared to $120 an ounce while oil remained fixed at $3.56 a barrel. The gold-oil ratio rose dramatically to nearly 34. In the next five months, WTI was officially priced at $4.31/bbl but because of ample supplies, actually sold for less than that on the open market. In 1956, King Hubbert predicted that US oil production would peak in 1970. And indeed that came to pass in late 1970. Production declined rapidly and imports doubled from three million to over six million bbl/day in 1973. Turmoil hit the industrialized world in October when OPEC initiated an embargo targeting eight countries that supported Israel during the 20-day Yom Kippur War. The embargo lasted for six months and the posted WTI price rose 235 % to $10.11 in January 1974. Despite a steadily rising gold price that reached over $170 in April, this effectively halved the gold-oil ratio to its common range in the middle teens. Fallout from the devaluation of the dollar, its free-float to gold, and the rise in oil prices led to the 1973-1974 stock market crash. The Dow lost 45% of its value, there was a severe recession with GDP contracting over two percent, and inflation surged to 12%. 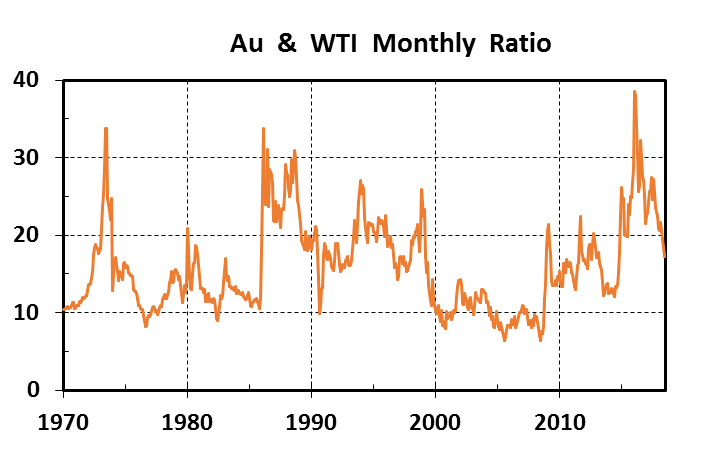 With steadily increasing prices for both commodities, the gold-oil ratio remained low for the entire remainder of the decade, generally from 10 to 15. It briefly fell below 10 from mid-1976 to early 1977 when the set price of WTI was bumped 15%. The Iranian Revolution in early 1979 and the eight-year Iran-Iraq War that started in 1980 were catalysts for a commodities boom from early 1979 to mid-1981. Both gold and oil had exponential rises. Global oil supplies were cut by about 14% by these two events, another recession ensued, and rampant inflation followed in the early ’80s. Gold spiked 400% from the low $200s in January 1979 to $843 an ounce in January 1980, a price level not reached again for 28 years. Its January monthly average was $675. Oil went up 260%, from $15.85 in April 1979 to a record high of $39.50 in April 1980. Ratios were not much affected, staying mostly at the mid-teen level except for the spike in gold in January-February 1980. In April 1979, President Carter began deregulation of oil that had remained in place since Nixon instituted price controls in 1973. In January 1981, President Reagan signed an executive order finally allowing US oil to trade freely in the open market. In late 1981, an oil glut developed with slowing of economic activity in industrial countries, increasing production driven by high prices, and a decrease in consumption spurred by conservation measures. Oil and gold prices trended somewhat lower over the next four years and the ratio generally ranged from 11 to 13 thru 1985. In early 1986, the Saudis got fed up with other OPEC members’ non-compliance with production quotas, opened the taps to full capacity, and flooded the world with surplus oil. Prices dropped like a rock, bottoming at little more than $10 in the US and $7 in the Middle East. The gold-oil ratio jumped into the 20s and stayed above that mark thru February of 1989. It reached highly anomalous levels above 30 for two months during 1986 and for two months in 1988. Gold traded above $400 while WTI was generally priced in the high teens after the market readjusted. This long-lived drop in oil prices severely affected the USSR’s balance of payments, leading to economic instability and its demise in 1991. When the Exxon Valdez ran aground in southern Alaska in March 1989 and spilled 250,000 barrels of crude oil, prices popped above $20 for the first time in nearly two years. Au:WTI fell below 20 for the first time in more than three years. The next big shock to oil markets happened when Iraq invaded Kuwait in August 1990. While gold hardly reacted to this geopolitical event, oil doubled in price. It averaged $39.57 a barrel in September and the ratio fell below 10 for that month. But much like the Gulf War, high oil prices were short-lived and in January 1991 were back to the $20 level. The Soviet Union collapsed in December 1991 and the prices of gold and oil barely moved. For the next six years both commodities were range bound, in the $300s for gold and high teens to low twenty dollar range for oil; ratios were in the middle intervals. The 1997 world economic recession known as The Asian Contagion knocked gold below resistance at $300 in December of that year and oil fell below $12 in November 1998. Gold remained below $300 for the next 3.5 years and many mines were shuttered. Fueled by the dotcom bubble, US stock markets were roaring by mid-1999 and world oil prices surged to $33 a barrel in November of 2000. Very low ratios were the result, commonly less than 10. Tech stocks took NASDAQ to record highs above 5000 in March 2000 and its subsequent crash took 78% off the market value at bottom in October 2002. Despite the chaos that ensued after the 9-11 terrorism in 2001, this geopolitical event that continues to negatively affect America’s economic well-being and foreign policy had no discernible effect on gold and oil prices or ratios. Soon an incipient bull market for commodities commenced when gold broke thru 4.5 year resistance at $310 in April 2002. Oil remained in the $30 range before starting its rise in conjunction with gold going above $400 in late 2003. Thus began a five-year boom across the sector with record highs for the major world-exchange traded commodities including gold, oil, copper, and uranium. Gold and oil rose concomitantly and ratios were uniformly very low including record outliers below 7.0 in the spring and fall of 2005 and in mid-2008. Gold reached a high of $1008 in mid-March 2008 and averaged $968/oz that month. Oil’s all-time high of $145/bbl was set in June and the ratio hit an all-time low of 6.4. Then Lehman Brothers failed in September and the global economic crisis followed. All commodities, including gold and oil, went parabolic within a couple of months. Gold fell to $714 in mid-November as speculators liquidated holdings to cover margin calls. Oil touched $30 in late December. The downturn was short-lived for gold with safe-haven buying in early 2009. Gold-oil ratios more than doubled to levels in the mid- to high-teens versus the outlying single-digit base of the previous two years. Oil recovered slowly but steadily as a second leg of the secular bull market for resources commenced. Gold soared in an exponential pattern, hitting its all-time high of $1895 an ounce in mid-September 2011 with a monthly average of $1772. A two-year top became a predictable parabolic fall in May 2013. Gold reached its nadir at $1049 in mid-December 2015 for a 45% drop off the all-time high. Oil prices were volatile during this time, ranging mostly from the mid-$80s to low $100s a barrel. Ratios fell within our most populated range in the mid-teens. These ratios shifted dramatically when oil crashed in Q4 of 2014, falling from an average of $106 in June to $28/bbl in January 2016. 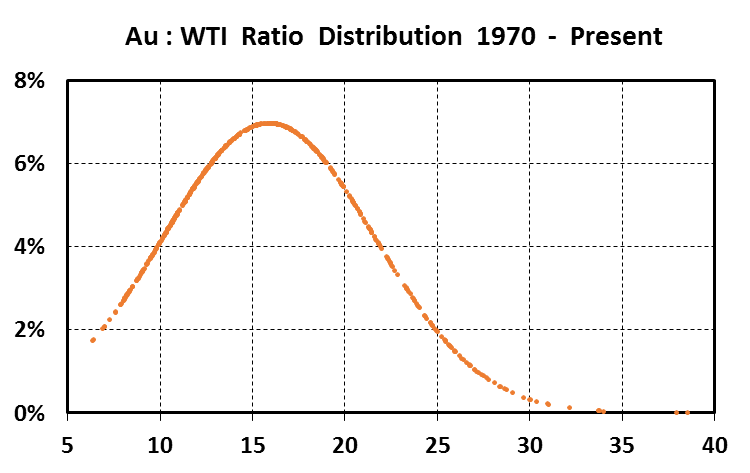 Gold was overvalued with respect to WTI (ratio >23.0) during the three-year crude oil downturn. In fact, it reached the two highest ratios ever in January and February of 2016 at 38.5 and 37.8 as all hard commodities bottomed. Late January 2016 was the nadir of a five-year down market for gold and it rallied strongly from there, topping out at $1341 for the month of August. Oil prices also bottomed but remained severely depressed until mid-2017. Ratios were at high to anomalously high intervals until recently. In 2018, gold averaged over $1300 from January to May. A long summer downturn combined with a strong US dollar took gold to a 2.5-year low of $1173 in mid-August. While gold has fallen, oil has rallied to a post-crash high ranging from $65 to $74 per barrel. Recent performance illustrates that commodity ratios always normalize in due course; we have seen that over the past few months with gold and oil. At 17.3 – 17.6 from June to August, the gold-oil ratio is now within its most common 48-year historical range and is not far off the mean of 15.9 and median value of 14.7.
overall health and growth of the world’s economy. trading and speculating in paper markets of both commodities including bullion exchanges, ETFs, futures and options, and other derivative markets. Physical trading of gold and oil are huge markets. That said, their paper and derivative instruments are orders of magnitude larger than the physical supplies available and constitute the two largest markets traded on world commodity exchanges. The gold to oil ratio is useful to determine if one commodity is valued fairly with respect to the other and is a useful parameter to predict future price movements. The ratio can also help determine the timing of speculations in the physical commodity itself, futures, options, and other derivatives, and/or equities and businesses that are part of the supply chain. In the previous 24-year period (1946 to 1969), prices were fixed by fiat and an ounce of gold bought on average 13 barrels of oil. In this 48-year interval (1970-2018) with the dollar floating against gold starting in 1973 and completely deregulated WTI prices after 1980, an ounce of gold on average bought about 16 barrels of oil. 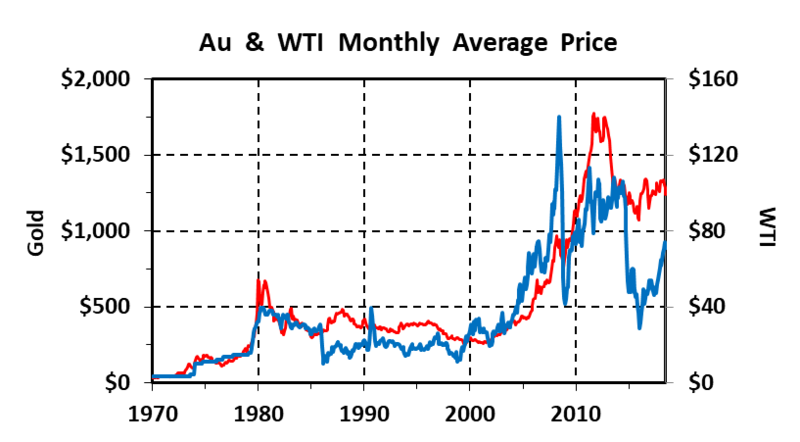 However, the greatest change has been the high variance and extreme volatility of gold-oil ratios. Folks, this is a good lesson in how capitalism works. In a free marketplace, prices move up and down for a variety of reasons, some of which are tabulated above for gold and oil. A free market presents multiple entry and exit points for investors, traders, and speculators to profit. I embrace this volatility and suggest that you should, too. As followers are aware, I view gold as the only money. It is my insurance policy against financial calamity and economic collapse. I do not invest or speculate in gold. As a hoarder, my basic strategy for accumulating gold or other precious metals is to buy during downticks in price regardless of bull or bear market cycles. And indeed folks, this is what I did over the past few weeks when the price of gold headed south. 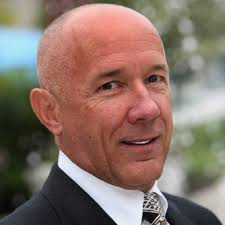 Acknowledgment: Troy McIntyre is the research assistant for MercenaryGeologist.com.